Most of us have experienced injuries that heal. But what about recurring injuries? The sore knee that stops you from walking or running! The sore shoulder that stops you gardening or going to the gym or picking up a child for example. What about the hip that literally stops you moving? Where is the answer to be found? And they would be correct because that is why the body does collapse… because it’s out of whack! The bones aren’t in the place they’re designed to be placed. The bones aren’t sitting where they’re designed to be sitting, and this is called body structure or body mechanics. This is one of the big reasons TriBreath is so effective in the treatment of mobility issues. Of course breathing is important as is the maintenance of lung capacity, but it’s via your breath that you can learn how to equally distribute the physical impact experienced by your body every time you walk and it’s via your breath that you can stimulate and vitalise your nervous system to promote regeneration. Most of us are familiar with the shape called the triangle. But did you know that the human body is designed not as one single shape called the body, the body is actually made up of many triangles that are ingeniously put together to make one body. Once you see it, you can truly but look in awe at oneself! It is for this reason that when you’re familiar with the TriBreath breathing rhythm’s, you very quickly come to the realisation that there’s more to TriBreath than first meets the eye. In the beginning the awareness of how rhythmic breathing creates an internal communication that literally promotes an “internal/inner movement” that is potent enough to alter the way we physically move, then think and act is indeed an eye opener. Call it realisation or simply awareness, whatever it is it’s good! From this point of familiarity with rhythmic breathing, where to next? From the respiratory system to the nervous system and to the potency of the triangle. Recently uploaded within the TriBreath member area are video’s that will teach you how to build upon your light-force using the triangle and the three TriBreath breathing rhythm’s to equally distribute this self-generated energy. This practice will help stimulate your nervous system that promotes regeneration at both the cellular and energetic level that literally builds the potency of your physical body up to no end. To generate your and distribute your light as you walk or run (paddle, push etc. ), this technique uses a similar technique as in the Little Breath Bigger Breath technique, but with this practice not only do you build your breath and lung capacity up, you add the building and generating of light into each breathing cycle. 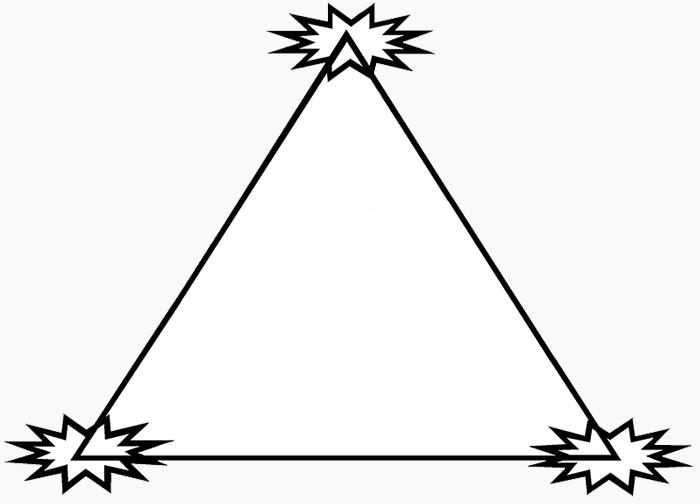 The triangle: three points joined together by three lines of force that make a three-sided shape. But three (3)… Three is three one’s… or two against one… or one against two! From the power of the three becomes an availability to help consciously align the two sides of your body up from your centre out. It is from your centre that all growth emanates be that physical, spiritual, mental or emotional. Imagine yourself self-generating a light force and then distributing this light force energy to various parts of your body with every exhalation or OUT breath. Using the forehead (the pituitary gland) as the distribution centre, it was over 16 years ago that i started using this technique to literally stitch up my back after i did a very good job of breaking it. Cracked vertebrae, blown discs, paralysis down the right leg… OUCH! For many months whilst lying flat on my back with my body pained and fearful of movement, my mind was very active. Sixteen years later and in my 50’s i can run like a gazelle and with ease. That’s the power that TriBreath and rhythmic breathing offers all of us who embrace the potential. With the three points of the triangle acting as illuminating points of light that vitalise three chosen parts of your body, this is where true regeneration can commence; from the electrical and power source, the nervous system. Just like a lighthouse shines through the darkness of night with a cyclic motion, so too does the balanced breathing rhythm you have create distribute the light from side-to-side on every OUT breath.